In 1977, Cambodian diplomat Ouk Ket received a letter from the government of Democratic Kampuchea requesting that he return home from his post in Senegal to help rebuild his country. Like many other Khmer intellectuals who were unaware of the horrors taking place behind the country’s closed borders, he returned to Cambodia and was never heard from again. When Clouds Fell From the Sky, a book released this year by journalist Robert Carmichael, is a compelling account of Ket’s family’s decades-long search to find out what happened to him. The book masterfully weaves together the stories of Ket’s French wife, Martine, their daughter, Neary; and his executioner, Comrade Duch. By combining Ket’s family’s travails with historical accounts and coverage of the recent Khmer Rouge tribunal, Carmichael has created a riveting portrait of the Khmer Rouge’s rule and now the tribunal’s attempts to reckon with its legacy. When Clouds Fell From the Sky draws on a daunting array of historical sources and interviews, offering the reader a surprisingly complete view of the Khmer Rouge era. It is the human element, though, that makes the book a page-turner. For example, Neary tells how Martine prepared to travel from France to Switzerland to meet Ket’s former boss at the embassy, now an ambassador for the Khmer Rouge government, in an effort to find out the fate of her husband, who had been missing for two years. Before their meeting, Martine cut her hair in the prescribed Khmer Rouge bob, put on a traditional Cambodian ankle-length silk sampot, and dressed her children in black pajamas and checkered kramas. Stories of Khmer Rouge atrocities can easily overwhelm readers, but this small glimpse of a desperate Frenchwoman cutting her hair and dressing her children as communists in an attempt to get any information about her missing husband is heart-wrenching. All the more so because, despite her efforts, her questions were met with evasions and lies and she had to return home with no news about her husband. It is in the small details that When Clouds Fell From the Sky comes alive. 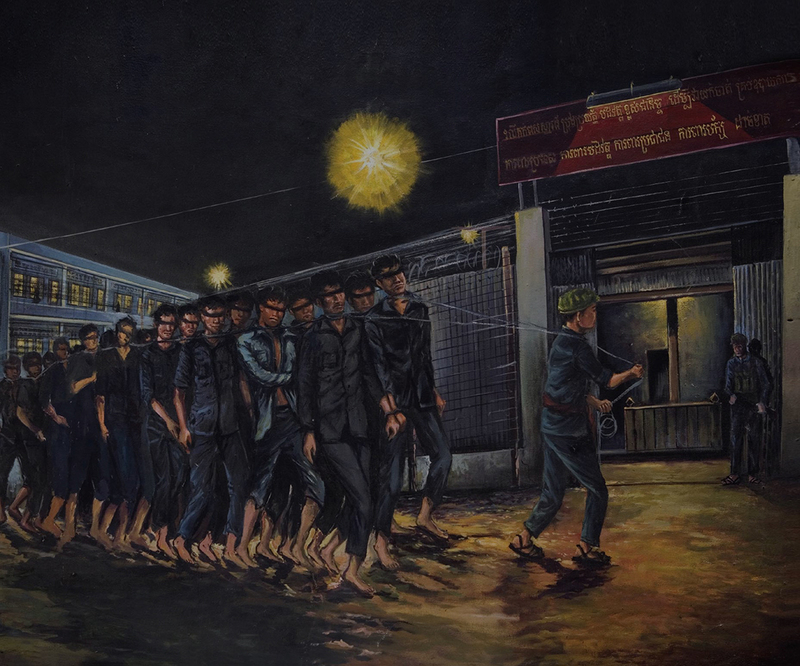 In addition to Martine and Neary’s story, the book deals with what happened at the S-21 prison and the first Khmer Rouge Tribunal trial of Comrade Duch, which began in 2007. The head of internal security for the Khmer Rouge, Duch’s actions and psychology are described in fascinating detail, as Carmichael tries to understand how this outwardly mundane man came to become the regime’s most notorious executioner. The portrait that Carmichael paints of Duch and the horrors of the infamous S-21 prison will make your skin crawl. Yet by portraying Ket and his life before S-21 so vividly, the book makes the monstrosities that took place there that much more vivid and horrifying. Duch apparently saw himself not as a vicious killer, but as a highly educated bureaucrat, one so obsessed with numbers and paperwork that he was able to ignore his own culpability and the enormity of his crimes. By the end of the regime, it is believed that more than 10,000 people were killed at S-21, all under Duch’s authority. Yet Duch fervently believes that he was just carrying out orders, doing what needed to be done. Most of us, hearing of the barbarities that took place in Democratic Kampuchea, might be tempted to believe just the opposite. But Carmichael, while not downplaying the atrocities of S-21, deftly makes the case that although Duch committed monstrous acts, he was not a sociopath or a monster. Rather, he was a man who sought a higher calling, and found that calling in his obedience to the Khmer Rouge regime. When Clouds Fell from the Sky: A Disappearance, A Daughter’s Search and Cambodia’s First War Criminal is available in Cambodia at Monument Books, and for Kindle on Amazon and Amazon UK. I would highly recommend the book to those who might find other historical texts about the period dull or lifeless; I found it hard to put down! For more information, check out whencloudsfell.com.